Tattooing since 1992, Erika Stanley has compiled a collection of collectors of her custom tattoos. 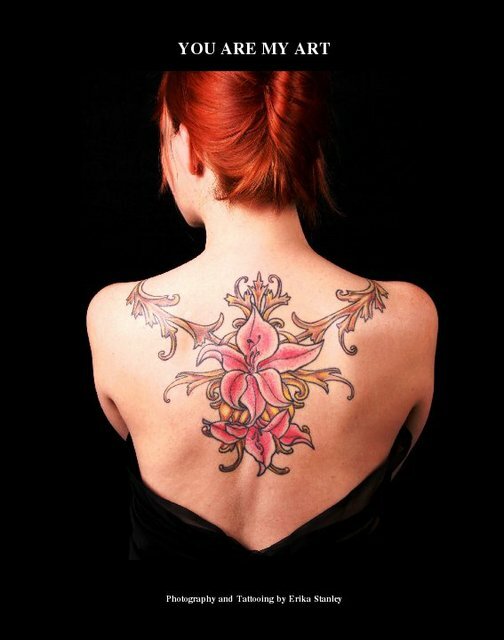 This book features large body art that she lovingly tattooed, and then photographed to portray the art in fine detail. A feast for the eyes, for every tattoo fan. I have been tattooing since 1992, I established the original Art & Soul Tattoo Co., in 1996. We have been in business ever since. I've been a freelance photographer since 1987 and a freelance journalist since 1998. For more information: www.erikastanleyarts.com www.erikastanley.com www.artandsoultattoos.com Art & Soul Tattoo Co. is a registered Federal Trademark. All rights to use the name are exclusive to Art & Soul Tattoo Co., Inc. Los Angeles. We only have one location. All other studios using the same name are doing so without permission. or a license to do so. All rights to use of the mark are reserved.